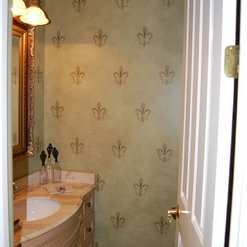 Eileen installed wallpaper in my powder room. She was knowledgeable, responsive, and a pleasure to work with. Eileen provided great advice regarding wallpaper selection. She was able to accommodate my schedule request and completed the project efficiently for a reasonable cost. The finished product was of high quality and looked great! I would recommend her to others and would use her talents again should the need arise. Eileen handled paint color and wallpaper selection for our new house. She was awesome, offered a lot of time flexibility for 2 working parents with young kids. 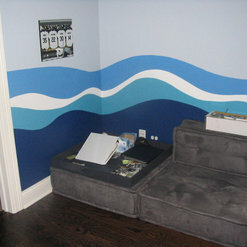 When we couldn't find wallpaper she proposed hand painted stencils. They look amazing, if we could afford additional services she offered, and we would be hiring for more. 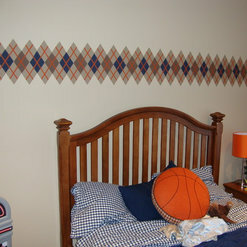 She also installed decals that we had selected for a playroom and exercise room. I Couldn't be happier with her work, out of all the finish work hers went off with the lest hitches. 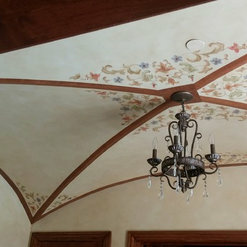 EILEEN HENNING HAS SKILLFULLY DESIGNED AND EXECUTED HIGH-END SPECIALTY PAINTING IN SEVERAL ROOMS IN OUR HOME. 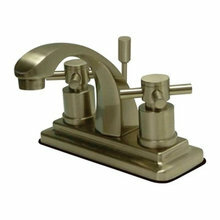 SHE IS ALSO EXCELLENT IN WORKING WITH WOOD STAINS AND FINISHES. I WOULD RECOMMEND HER TO ANYONE WHO VALUES QUALITY WORKMANSHIP AND CREATIVITY. 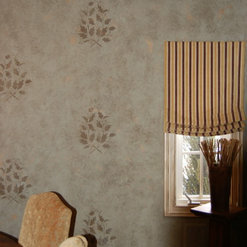 Recently, I had the pleasure to work with Eileen on some wall paper projects in my home. Eileen was amazing to work with. She had great ideas and suggestions when selecting the wallpaper for my dining room. 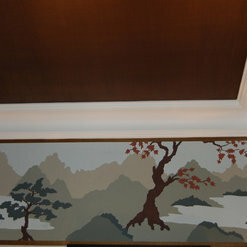 Eileen also did some painting to enhance a fireplace surround. Eileen was was very fast and efficient to complete her work within our timeline. Most importantly, Eileen is exceptionally talented. Eileen ensures that every small detail is thoughtfully taken care of. Her work exceeded my expectations in many ways. I will definitely hire Eileen again and recommend her to anyone! Eileen offers her services for interior painting and wallpapering, but she would be best described as an artist with extraordinary good color skill and taste. She has done both new and remedial work in our home, the latter being replacing wallpaper, and painting to cover up severe water damage. She has developed a multi-step process which results in an elegant painted surface that gives the impression of being seamless wallpaper. In one project, she overlaid this surface with multiple Frank Lloyd Wright motifs in varied sizes and patterns. 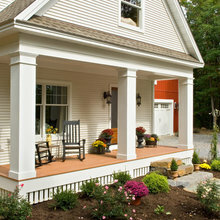 High quality wood refinishing is another specialty. On both bid and time and material projects, her charges have been extremely reasonable for the value provided. She meets time commitments and is a very pleasant person with whom to work. Eileen has done painting and wallpapering for us. 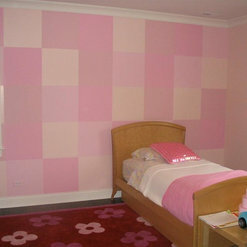 She has also help us with picking out the wallpaper and color in different places. I cannot rave enough about her. She is very professional and everything is perfect when she is finished. I highly recommend her. 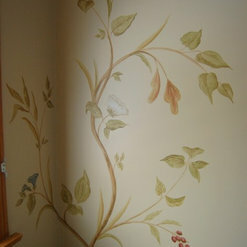 We've had Eileen do various decorative painting projects throughout our house, most recently in the baby's nursery. She is awesome! We get so many compliments when people see what she has done. And she is a pleasure to work with. Definitely recommend! Our company has had the pleasure of working with Eileen Henning on various new custom home projects where her wallpaper/paint expertise has really been an asset. 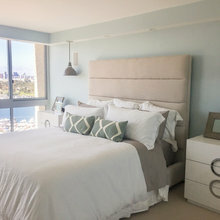 She is very talented, thorough and professional and I recommend her to anyone looking for wallpapering, paint consultation or detailed custom wall finishes. I recently wanted to have my foyer faux painted. I obtained 3 estimates and not only did I think Eileen's input was helpful, but the cost was also very fair. I am extremely pleased with the end result. I've had several people walk into my house and comment how cool the foyer walls look. I would highly recommend working with Eileen. Eileen did a wonderful job helping me choose paint colors for my new home as well as suggesting a gorgeous wallpaper for my powder room which she hung beautifully. She also continues to assist me decorating my house and is always very responsive offering the best advice. 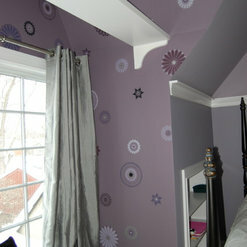 I get compliments daily on my paint colors and I thank Eileen for her fabulous vision. Eileen does a fabulous job! A great eye, and super creative. 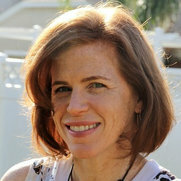 She listens to her clients visions and has beautiful solutions. She was fast and very detailed oriented. I loved working with her. I would highly recommend her again and again! 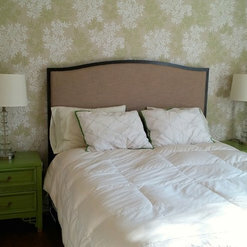 Commented: Paint or decals?these are painted, with colors chosen to complement the bedding. Commented: where is the vanity from? 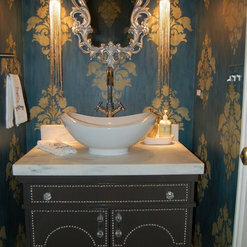 Love!This was the existing vanity. 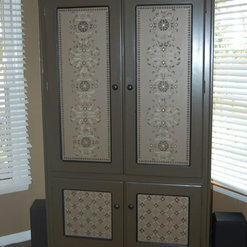 I painted it in a high-gloss finish and applied nail-head trim from Beacon Fabrics. Commented: Lovely bathroomHi! lights are the Beaded Sconce from Nova Lighting; the mirror is a second-hand item that was painted silver.